“I hope in 50 years to come we celebrate this campaign as a relic of the past because women will have attained the kind of equality and respect that makes recognition organic! We will miss you Bonnie but thank you for your light – here’s to our Fifty Inspiring women and the generations of women who draw inspiration from them,” said Bouwer. #cocreateSA is a platform for South African and Dutch counterparts to exchange ideas and innovations for a sustainable future. It stimulates collaboration between South Africa and the Netherlands based on the belief that if we work together, we can make a difference and co-create solutions for local challenges. 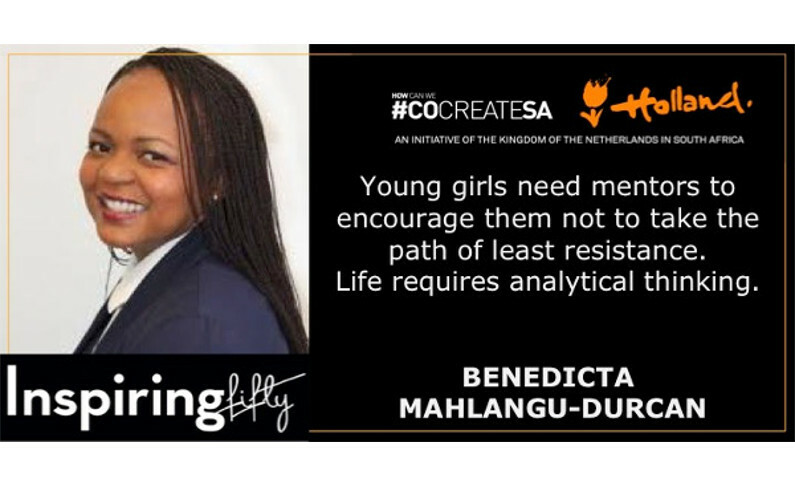 #cocreateSA is an initiative of the Kingdom of the Netherlands in South Africa, capturing the true essence of modern foreign diplomacy: building relationships, putting the demand at the core of our discussions and focusing on long-term commitments and partnerships. Inspiring Fifty is a Dutch based non-profit organisation that showcases inspiring female role models in the technology industry in the Netherlands, France, Europe and the Nordics. Built on the core philosophy ”If she can see it, she can be it”, Inspiring Fifty annually awards the 50 most inspiring women in the technology sector with the aim of providing a platform that brings more visibility to the achievements of women in the innovation and technology sector.